As the weather gets cooler and fall ushers in colder winter months, we unpack scarves, boots, blankets, and hot cider recipes in preparation for the cozy months ahead. What we don’t always consider, however, while closing our windows and bundling up, are the health dangers inherent of this season as indoor air grows stagnant and poses potential dangers to our families. While those already suffering from breathing problems have come to expect serious ramifications from poor air quality, even normally healthy individuals should be aware of how their health may be affected. According to the Occupational Safety and Health Administration (OSHA), symptoms of poor indoor air include headaches, fatigue, trouble concentrating, and irritation of the eyes, nose, throat and lungs. [ii] These effects are exacerbated as winter continues and lack of proper ventilation throughout our homes worsens. Poor ventilation means that cleaning product fumes, molds, dust, and other allergens build-up in our bedrooms and living areas, creating potentially toxic environments for our kids, our guests, our pets, and us. When windows are shut tight, germs and toxins can easily have a heyday; increasing our chances of contracting illnesses and worsening allergies. We must be proactive if we hope to enjoy the pleasures of the season without exposing our families and ourselves to harmful environmental factors. So, while sipping cider, there are measures we can take to increase the quality of our families’ air during the cold months to avoid the potential health dangers associated with this season. 1.) Open windows (even for a short period of time) whenever the weather permits. Although the frigid temperatures might prevent opening windows regularly, take advantage of warmer days by naturally ventilating as many rooms as possible. Enjoy the aromas of baking pies, brewing coffee, fall leaves and other naturally occurring autumn/winter scents. Diffuse only therapeutic-grade essential oils such as lavender (helps with allergies), lemon (helps clean the air), or a therapeutic blend to create your desired mood. Leave a pot of cider on the stove or simmer a mix of cinnamon sticks, cloves, lemon, and apple juice. Limit the use of cleaners. Opt instead for lemon and baking soda or a mild soap. 3.) Place houseplants throughout your home. NASA research has shown that plants help purify air space by removing chemical vapors and toxic gases. 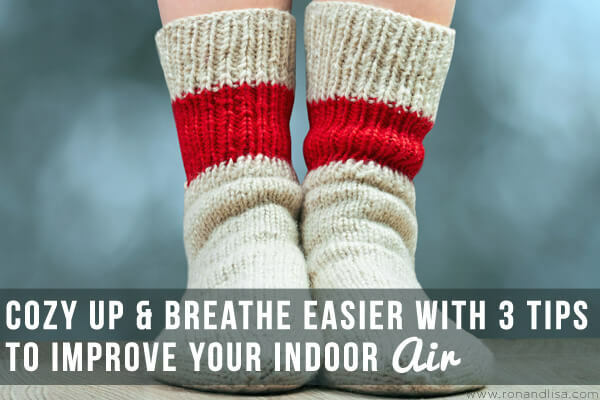 As we hunker down during cold weather and snuggle in front of the fireplace, we should to be conscious of the effects that too little outdoor air has on our overall health. Make it a goal to dress appropriately, take a brisk walk, and enjoy the outdoors whenever possible. Experiment with natural essential oils and scatter plants throughout your home to help purify an otherwise toxic environment. [i] Davis, Jeanie. (n.d.). Breathe easy: 5 ways to improve air quality. WebMD.com. Retrieved from http://www.webmd.com/lung/features/12-ways-to-improve-indoor-air-quality. [ii] Jovinelly, Joann. (n.d.). COPD and allergies: avoiding pollutants and allergens. Healthline.com. Retrieved from http://www.healthline.com/health/copd/allergies. [iii] Occupational Safety and Health Administration. (n.d.). Safety and health topics: indoor air quality. Office of the United Stated Department of Labor. Retrieved from https://www.osha.gov/SLTC/indoorairquality/. work. Active parenting takes on many forms and can employ different methods. If your baby has or is prone to acid reflux, make sure your baby’s head is higher than his or her tummy. homeschool him. Latin grammar rules that deal with case and agreement, for example, can make you think about these word relationships in English.